For over a year I’ve been working on a wearable which will track physiological and environmental parameters during meditation. 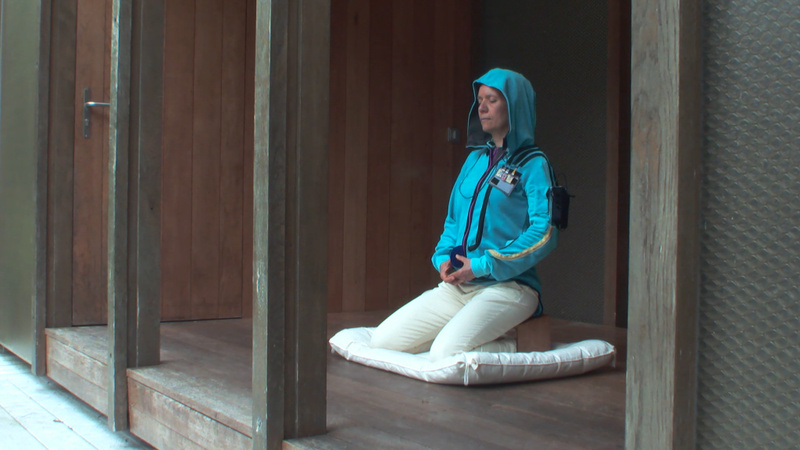 The idea was to improve the quality of your meditation by changing aspects of your environment e.g. light, sounds or temperature. In the spring of this year the opportunity arose to apply for an open call organised by the EU. The aim of that call is to generate knowledge about and new applications that address important issues concerning wearable technology today: data ethics and sustainability. Teams consisting of artist/designers and technologists were invited to apply for the WEARsustain open call. I’m happy to announce here that my project is one of the 23 winners. For the next 6 months I’ll work with a great team of experts to realize this project. There’s what we’ll do. 1) Monitoring: A two piece garment, Silence Suit houses seven different biometric sensors and three environmental sensors. 4) Sharing: Live or logged data can be used for to create custom output, in this case artistic visualizations for others to experience meditation. The development will be staged around experiments. I will conduct 1-person meditation sessions in a controlled and customizable environment to explore the influence of light on meditation. Sensor data is combined with qualitative input about the session. The aim is to make 5 wearables. That way I can test the results in group experiments. I want to make sustainability as easy as possible for the user. The hardware consists of of-the-shelf, low cost and open source sensors. This makes replacement easy. The battery and micro-controller container will be 3D printed. This allows for easy adjustment and replacement. All schematics and patterns will become open-source. Users can keep working with the components and customize the suit. With regards to data ethics I believe that people have a right to own their data and that sharing should be opt-in only. That is why the software should function fully stand alone to protect the personal data. Basic statistical analyses let users explore their data. This makes it easy to independently make sense of the data. The kit democratizes doing scientific experiments and promotes data literacy. Here’s a video I made together with Michel Gutlich about what we intend to do. ProtoSpace will work on the dataserver. Vera de Pont will design a new suit and sew the wearables in 3 different sizes. Hans d’Achard will manage the system architecture and technology management of the software system. Germán Bravo will provide expert knowledge and work on the machine learning. Meike Kurella will be my intern for this period. She’ll be blogging about the process and help out with all kind of hands on tasks (sewing, soldering and help out with the experiments). I’m very much looking forward to starting the project and learning how technology can support spirituality and health. Check this blog for the latest updates.